Make sure you don’t miss this year’s must see double bill. 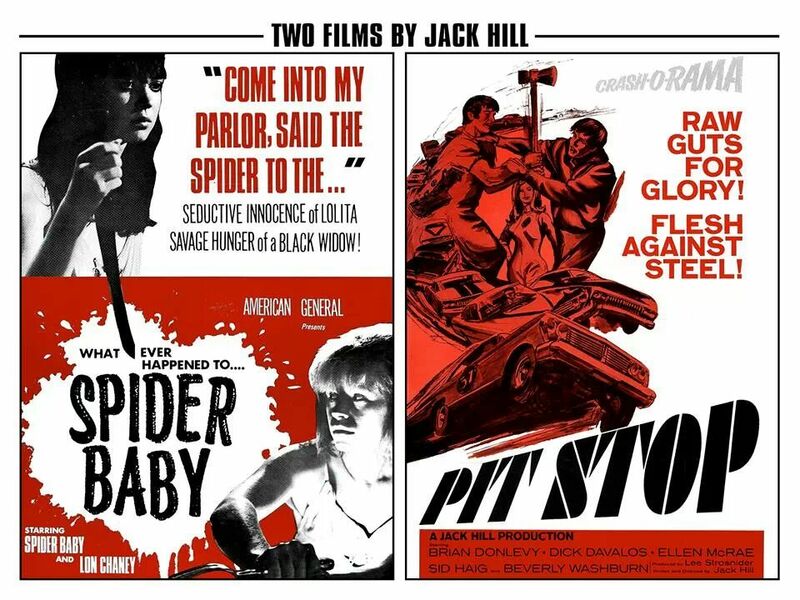 An exclusive screening of ‘Spider Baby’ and ‘Pit Stop’ followed by a Q&A with legendary director Jack Hill will be held at the Ritzy Brixton on Saturday 7th September. ‘Pit Stop’ is to be restored in association with Jack Hill and released on DVD/Blu-ray in 2014 for the first time in the UK and receiving its worldwide premiere on Blu-ray. Flesh against Steel! From noted writer/director Jack Hill (Swinging Cheerleaders, Switchblade Sisters) comes this tense tale set against the backdrop of the auto-racing world. Pit Stop features long-time Hill acting favourite Sid Haig (Spider Baby) and an early big-screen role for a young woman named Ellen McRae, later to be known as the Academy Award winning Ellen Burstyn of Martin Scorsese’s Alice Doesn’t Live Here Anymore. This is an early film with Sid Haig and Ellen Burstyn and is an excellent watch. Brian Donlevy (The Creeping Unknown) stars as an ambitious promoter who helps to bring forth the new “Figure 8” style of racing which provides the latest thrills that can both propel the hottest drivers into the spotlight and just as quickly take it away. Using stunningly realistic footage shot on actual raceways. Pit Stop gives you the intense heat, the fiery competition, and the unavoidable consequences in this dangerous sport! The credits dub this the maddest story ever told, a promise that’s well on the way to being fulfilled in the opening scene alone, when Virginia traps and kills a hapless deliveryman in her makeshift web. She s one of three siblings who suffer from a unique genetic disorder that causes them to regress back to childhood, while retaining the physical strength and sexual maturity of adults.